We were fortunate enough to have some dear friends from San Francisco come to town right before the holidays. We love to travel, eat and drink with them and when we get the chance to gather, its always around food! When I asked them what they wanted to do, they said "cook a fancy meal at your house" and I was SO. DAMN. EXCITED! It had been a while since we have gotten the chance to cook together and when 4 people who love food get together in the kitchen, magic happens! My next question was of course, what should we make? My friend asked me to teach her to make pasta! Music to my little Italian ears! 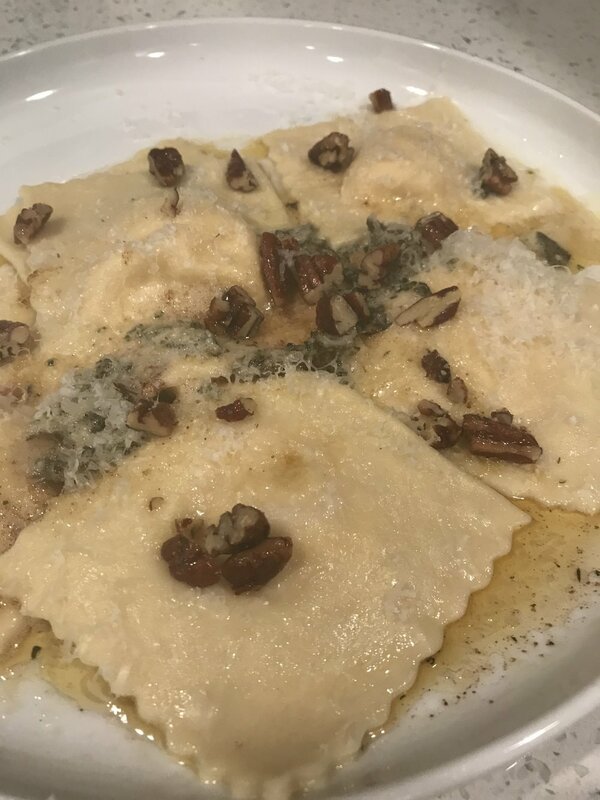 After weeks of back and forth menu planning, we decided to go with Butternut Squash Ravioli (amongst the other 4 courses) and to use up the last of my Wild Willow Farm CSA. I will say, being in the kitchen with friends, sipping cocktails is one of my favorite places in the world. Please enjoy the recipes below for the dough, filling and sauce. And of course, enjoy the photos! Making pasta is such a team effort and is so fun and memorable! Buon appetito! Make sure you and working on a clean and dry surface. We work right on our clean counter, but if you prefer a board, thats great too! Form the flour into a well on the counter. Crack all 6 eggs into the well. Slowly start whisking the eggs while adding the flour, little by little. Once the dough starts to form, thats when you start to use your hands and the dough scraper. Kneading the dough can be a lot of work (especially if you're short like me and the counter is not at an ideal height) so we subbed in the guys for a little extra elbow grease. You want to fold the dough, knead it and then fold it over again and rotate it, repeating til it starts to get its rich vibrant yellow color. You'll know the dough is done with its elastic enough that you can push your finger into it and it will reform. An old teacher from when we lived up in SF says, when its ready it smells like dough. If you can let the dough rest for an hour, thats best. If not, thats okay too! Wrap the dough in plastic wrap and leave on the counter. After the dough has rested, sprinkle flour on the counter. Cut the ball of dough into 4 equal parts. Roll out the dough so it is in a rectangular piece, about 1/16 inch thick. The speed of the stand mixer isn't crucial, go at a pace that works for you, but not too fast... this will dictate how fast the dough comes through the roller. Set the roller on level 1. This is the thickest setting for the roller, and we will incrementally increase the level each time we pass the dough through. On level 1 on the pasta dough maker, run the dough through. Its okay if it falls apart, just knead it back together and start over. Each time you run the dough through the pasta maker, kick it up a level until you get to level 5. Each time increasing one level, and in turn, making the dough thinner. Once you've hit level 5, you're done, and chances are you have a 4 foot long piece of dough. Lay the dough on the floured counter and cut it into 2 - 2 foot long pieces. Now we are ready for the filling! While the dough was resting, we made our filling! We started off by peeling a baby butternut squash that we had from our Wild Willow Farm CSA. Once peeled, we diced it, coated it with olive oil, salt & pepper and then roasted it for 30 minutes on 375 til it was soft and tender. While the butternut squash was cooling, we worked our ricotta through a fine mesh strainer to give it a more fluffy and creamy character. We then transferred the ricotta to a mixing bowl where we added the freshly grated parmesan and egg. Once the butternut squash was cooled enough, we mashed it, then added it to the filling mixture continuing to mix til combined, and then seasoned with salt and pepper. Note: Make sure you let your squash cool off before you add it to the cheese mixture or else you're liable to get scrambled eggs ;-) Once you have your filling to the consistency and flavor you like, transfer it to either a pastry bag or a ziplock bag to make it easy to fill the ravioli. Crack one egg into ramekin and beat til egg wash has formed. The sheets of beautiful dough are now ready for their filling! 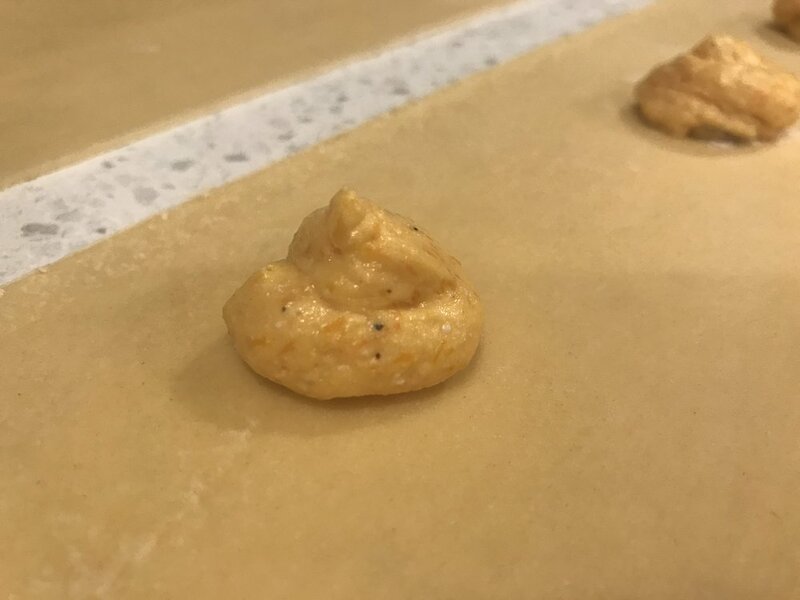 Cut the tip of the ziplock bag and carefully pipe quarter sized dollops of filling about 2.5 inches apart from each other, towards one side of the sheet of dough. Once the filling is in place, trace the outside edges around the dough with your egg wash. Next, fold the other side of the dough over to cover the filling. Pro tip: We like to put our filling a little towards the center of the sheet so that when you fold the dough over, the filling is at the crease, making it only 3 sides of dough to cut and seal. Once the dough is covering the filling, gently work your fingers around each filing, pressing the dough together and getting rid of any air bubbles that might have formed. This is crucial so that your raviolis do not burst open while you boil them. Once the dough is sealed around each dollop of filling, cut out your raviolis. You can use a straight knife or a fancy shaped one to give it an extra seal and fun cut. Repeat for how many ever sheets of dough you have. Store them on a piece of wax paper dusted with flour until you're ready to cook. Heat a pot of water on the stove until boiling. Add a pinch of salt and a drizzle of EVOO. Once you're ready to cook, drop no more than 12 raviolis in a pot of boiling water. They'll take 5-8 minutes depending on how al dente you like your pasta cooked. When they start floating, they're almost done. We always do a little poke test to check their firmness.